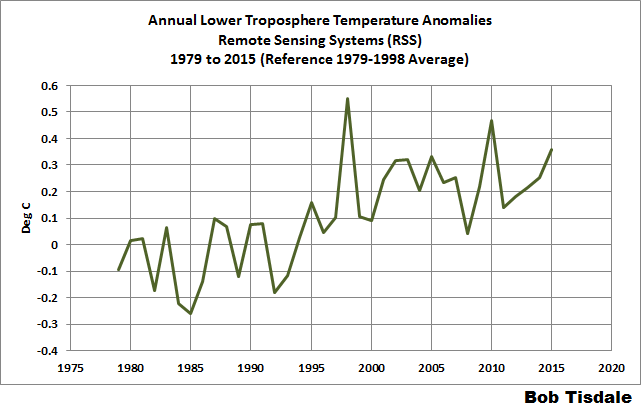 As expected, annual global lower troposphere temperature (TLT) anomalies in 2015 for both the RSS and UAH datasets ranked a remote third warmest. See Figures 1 through 3. RSS data through December 2015 are here. UAH data (beta 6.4) are here through November, and the December 2015 value of +0.44 deg C is from Dr. Roy Spencer’s blog post here. Keep in mind, however, that lower troposphere temperature anomalies are expected to rise sharply in 2016 in a lagged response to the 2015/16 El Niño. See the post Evolutions of Global Surface and Lower Troposphere Temperature Anomalies in Responses to the 1997/98 and 2015/16 El Niños. Next on the list is a post presenting meteorological annual mean (December-November) surface and lower troposphere temperature anomalies. I’m waiting for UKMO to publish their November 2015 HADCRUT4 values. This entry was posted in TLT Update. Bookmark the permalink. 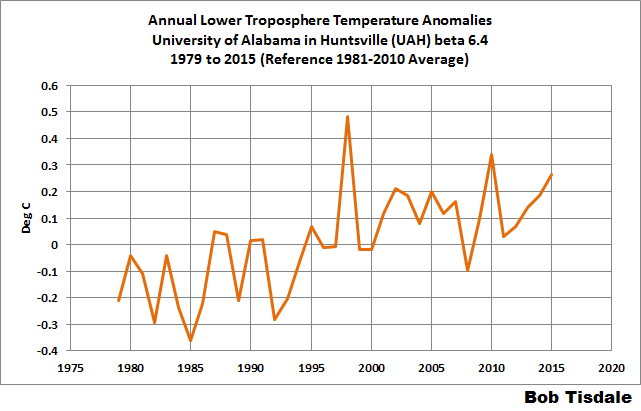 I have updated the UAH global temperature graph in my climate and meteorology pages, also the Tornado Climatology article. Pingback: Watts Up With That? It seems odd for the headline to point out that in the RSS and UAH LTT products, 2015 was a ‘distant’ third, while the body of the article points out that there is a lagged response to El Niño events in all LTT products. Why compare, in the headline, this pre-El Niño year’s measurements to the two highest post-El Niño years, especially given that the body of the article implicitly points out why such a comparison is invalid? Pingback: GISS and NOAA to Announce 2015 “Record High” Global Temperatures in Joint Media Teleconference Today | Watts Up With That?